Engine No. 54 at Mound Street. Photo from the Edward H. Miller Collection. The portion of the railroad north of Columbus was built under the name Columbus and Toledo Railroad. During the early 1870's, its supporters spent a considerable amount of effort raising the $3.3 million needed to build and equip the line. The contract to construct the Columbus and Toledo went to former C&HV President Benjamin E. Smith and nine others under the name Miller, Smiths and Company on April 16, 1875. Since grading in and north of Columbus had not been completed, the spiking of the first rail took place in Delaware on April 29, 1876. One of the Delaware crews reached Marion in June 1876, while the other one met a crew working out of Columbus in July. In early May, another construction camp began to work out of Carey in both directions. These crews reached south to Upper Sandusky and north to Fostoria in August. 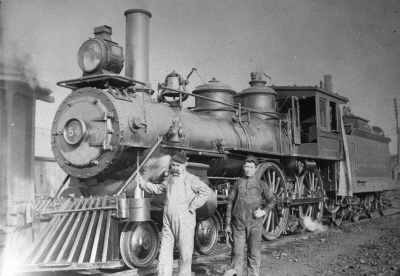 September brought completion of the Marion - Upper Sandusky section producing 91 miles of Railroad to Fostoria. Rails reached Bradner in early October and Walbridge in November. Opening of the 45-mile section between Columbus and Marion occurred on November 1, 1866, and the entire line was in operation on January 10, 1877. 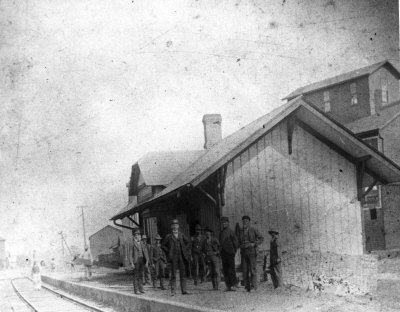 The first Prospect Depot was located on the eastside of the tracks. Photo from the Edward H. Miller Collection. The line began at the Columbus and Hocking Valley's North Yard, which was 0.9 miles west of the passenger station. Actual milepost 0 for both railroads was at High Street. Of the 118.3 miles to Walbridge, no grade exceeded 0.50 percent and 43.5 miles were essentially level; 110 miles were straight and no curve exceeded three degrees. The Columbus and Toledo ended at Walbridge, five and one-half miles south of Toledo. The company signed a contract for joint use of the Toledo and Woodville (PRR), including its bridge passenger station, terminal facilities and connections. The C&T built its own facilities to handle coal and iron ore - the real reason for its existence - on the west bank of the Maumee River just north of the T&W's station and south of the present day Interstate 280..
By 1881, the C&T owned 18 virtually identical 4-4-0's. Eleven came from Hinkley, five from Rogers and two from Brooks. Ten were passenger engines and the other eight were for freight. Toledo and Woodville dock on the Maumee River. Photo from the Edward H. Miller Collection. 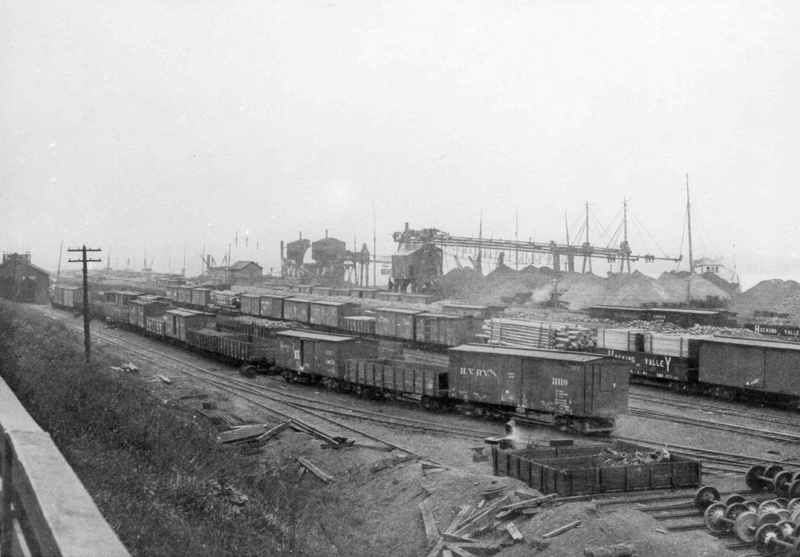 The C&T was built principally as an outlet for Hocking Valley coal, which accounted for 60 percent of the line's tonnage. Another 5 percent came from grain products, 25 percent from lumber and the remaining 10 percent from passengers, mail and express. Both the Columbus and Toledo and the Columbus and Hocking Valley had the same management since 1876 and nearly the same ownership. In 1878, they added a third line to their fold.